On Christmas Eve, my Mom tried to have a little live Nativity with the grand kids. She put together some very sweet costumes, but staging such an event with a 3, 2, and 1 year old got a little crazy. (There were some older kids too and they behaved very well). 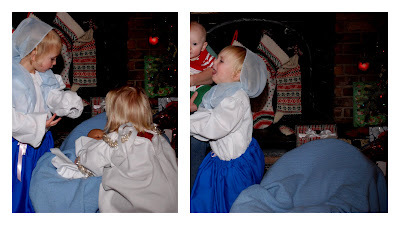 At one point, Jane, playing an angel, stole baby Jesus from the manger and ran away laughing. I wish we had video of it, but I did get the two photos above. Mary was not happy about it and started wailing. Jane is turning into a very big tease and loves to take things. I partially blame Jane's love of Dora and her exposure to Swiper the Fox. Mary and Baby in happier times, pre-abduction. At one point Mary had to add a stroller to the manger scene. My mom was a little frazzled by the end, proclaiming "well, you all know the ending". When the Wise Man brought a gift, Mary and Joseph had a little struggle to control the offering. Colin played Joseph and was very sweet (before the Wise Man gift). He has very much gotten into the story of Christmas this month, thanks to all the great Christmas books we have been reading. A couple of times I have heard him playing on his own and making mangers for baby Jesus.